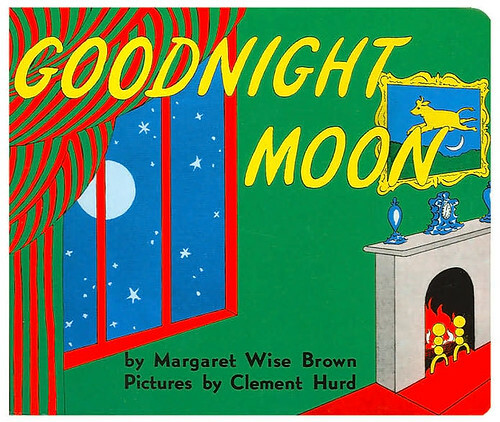 Since this blog is all about me, I'm going to write about Margaret Wise Brown's Goodnight Moon... again. Beautifully illustrated by Clement Hurd, it's the book I most fondly recall from my childhood. When James was younger, we read it every night. In fact, at two he was reading it to me. Well, he wasn't quite reading it, but he was reciting it. It's now the book I read to Michelle before she drifts away into that sweet slumber. She too has it memorized and hits every note on every page with a quiet emphasis of the word "hush" and a tailing end for the closing "everywhere". This is by far my favourite children's book and for obvious reasons. When I'm an old dude in the twilight of my life, I hope James and Michelle will read it to me. I don't remember this book from my childhood, but I have read it to my daughter numerous times (she is now 4), and I still tear up and have trouble finishing the book without crying like a baby. It gets to me everytime! I remember both my boys as little ones with chubby fingers trying to grab the little mouse on the blank page.